Bhubaneswar: BJD strongly condemns the violence perpetuated by BJP against CM’s Private Secretary Karthikeyan Pandian. 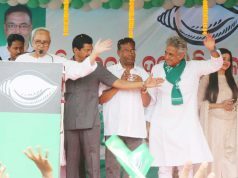 BJD said facing an impending loss in Bijepur by the BJP, the Bharatiya Janata Party has become intolerant. During the absence from his residence of senior IAS Officer V. Karthikeyan Pandian, Private Secretary to Chief Minister, Government of Odisha a large group of BJP activists barged into his residence and destroyed property while threatening the staff present there. 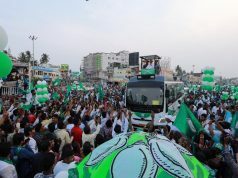 BJD alleged this was a cold-blooded, planned violent act by the BJP. In doing this, they exhibited their love for violence and scant respect for law and order. They further threatened the security staff at the residence stating that they would deal violently in this manner with those who opposed Union Minister Dharmendra Pradhan and MP Baijayant Panda. 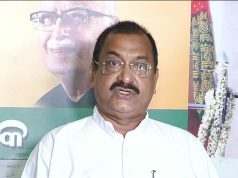 BJD said with an electoral loss staring in the face of the BJP in Bijepur, they are indulging in such acts to divert attention and somehow delay or postpone the by-election at Bijepur citing law and order issues was stated today in a Press Conference at BJD party office by Spokesperson and MP Shri.Pratap Keshari Deb. He further added that these are some cheap violent tactics being used by BJP now and the party is trying to terrorize the administration and thereby gain an upper hand in the said election. The BJP is creating an atmosphere of intolerance in the state. The Officer is the Private Secretary of the Chief Minister and in his absence the BJP goons terrorizing his wife and two little children is very unfortunate and strongly condemned by BJD. Shri. Deb also demanded that Union Minister Dharmendra Pradhan and MP B.J. Panda must clarify their stand in this matter. Shri. V.Karthikeyan Pandian is an honest officer of impeccable integrity and commitment. Over the years of his service in Odisha, he has been widely acclaimed for his selfless devotion to his work and the people remember him fondly for his dedication. This violent attack on his house by the BJP has drawn widespread criticism from various organisations like the IAS Officers Association, OAS Officers Association, Odisha Police Officers Association and many others who have strongly condemned this act of intolerance and savagery by the BJP. Further the BJP’s allegations before the Chief Electoral Officer today is solely to postpone the Bijepur elections which is condemnable.